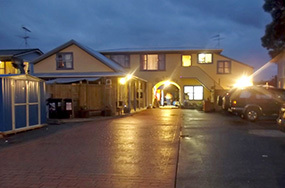 Pillows Travellers Lodge is conveniently located near the Centre of Orewa, handy to Town centre shopping, as well as the famous Orewa Beach, Waiwera Thermal Pools, Gulf Harbour and the Peninsula Golf Course. From Auckland, take the motorway north and turn off at the Silverdale / Orewa Beach turnoff. Turn right onto the Hibiscus Coast Highway. Go along the Hibiscus Coast Coast Highway, and you will see Pillows immediately on your left just after the MacDonald's Restaurant in Orewa Town Centre. Drive past Wellsford and Warkworth along the Hibiscus Coast Highway. 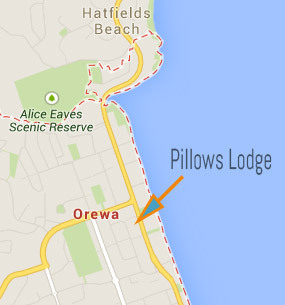 You'll see Pillows on your right just before you enter Orewa town centre.